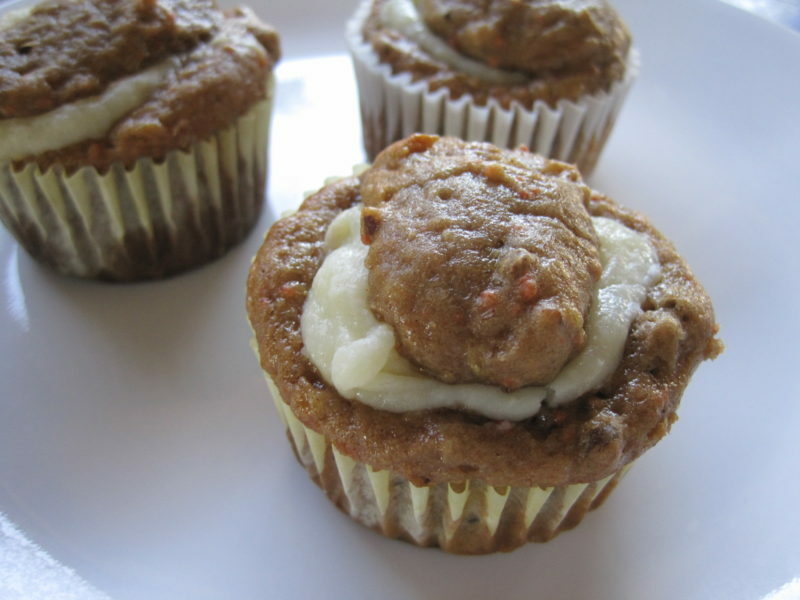 These cream cheese filled carrot cake muffins are perfect for back to school. They are perfect for a quick, grab and go, breakfast, and they’re a great addition to a lunch box. The luscious, creamy filling makes them irresistible. These Muffins even have a secret ingredient. They’re made with bananas. In fact, this recipe is very similar to the one I recently posted for the chocolate chip banana muffins recipe that I shared last week. This recipe is only a little more complicated because of the extra step of making the cream cheese filling, but it’s completely worth the effort. The sweet, creamy, and tangy filling makes these muffins feel a little decadent. They even freeze well if you want to make a bunch of these ahead of time to keep on hand. All you have to do is wrap each muffin individually, and store them in a larger airtight freezer container or freezer bag. These cream cheese filled carrot muffins are Baker’s Man approved. What that means is that he took the entire pan of muffins and stashed them in the mini-fridge in his office. He didn’t want to share, and he’s usually a very generous man. 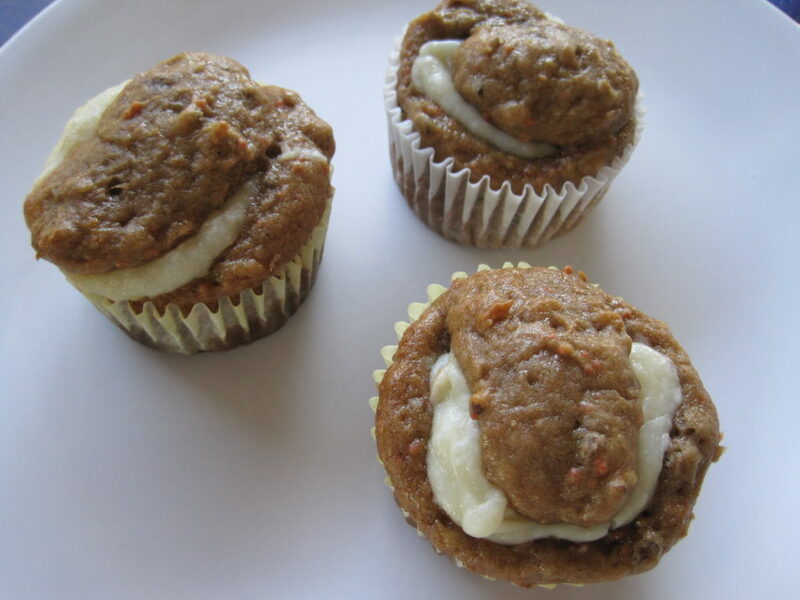 Give our recipe for Cream Cheese Filled Carrot Cake Muffins a try and let us know what you think by leaving a comment below. This simple, cake mix based, muffin recipe is almost decadent thanks to the vein of cream cheese filling. These were a huge hit in our house. Store the uneaten muffins in the fridge. They also freeze well. Wrap individually in plastic wrap and store in a single layer in a freezer bag. Total Cost of recipe is $6.56 if using pecans or $4.97 if using walnuts. Without nuts, the recipe only costs $3.79. The price per serving is $0.22 to $0.37 per muffin depending upon your ingredients. Stir in cake mix until a thick batter forms. Add nuts and stir to incorporate. Spoon batter into paper lined muffin tins, filling 18 of them ⅓ of the way. Mix together the cream cheese powdered sugar, and vanilla extract. Top with the reserved cake batter. Fill any empty cups on your muffin tin half way full of water to ensure even heating. Bake at 350 degrees for 20 - 25 minutes or until done. Store uneaten cupcakes in the refrigerator or freezer. I love carrot cake and I just realized it’s been too long since I made some. This is a clever way to fill these! These muffins were the result of some family negotiations. Baker’s Man wanted cream cheese frosting, but Sue Chef wanted muffins. The cream cheese filling was our compromise. 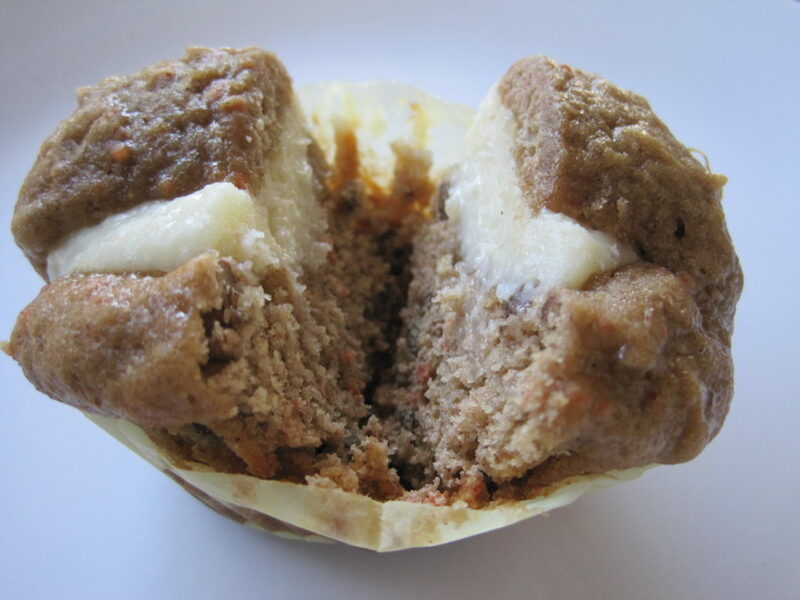 Carrot muffins or cake and cream cheese just seem to go together. It’s my husband’s favorite combo! Although I think he would probably side with Baker’s Man. Isn’t it funny how men love their sweets. Baker’s Man Is addicted to carrot cake, and he loves thick cream cheese frosting.